The ProQ Stretch Reverse Flow Cabinet Smoker is a fully insulated upright cabinet smoker. Stretch is the Tubby’s taller brother, weighing in at 280KG and standing 1.56m high, it holds the advantage when it comes to capacity. It’s extremely well built and the cooking and fire chambers are constructed using 4mm plate steel for longevity as well as heat retention. To add to this, these cabinet smokers are insulated using high quality heating insulation for efficiency and stability in temperature. The Stretch is a beautiful bit of kit that’s built to last. Stretch comes with 6 cooking racks, but has space for 11 if you need to up the numbers when doing things like ribs and wings. 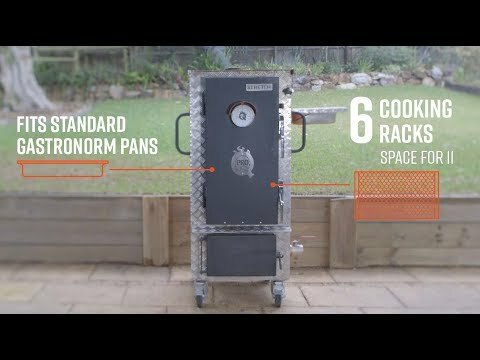 Each grill rack is slightly larger than a standard 1:1 Gastronorm pan, measuring 570 x 390mm meaning when catering you can use the unit as a holding cabinet, or just to hold your briskets. We do also offer stainless steel grates as an extra for ease of cleaning. As you can see from the images, the fire chamber is directly below the cooking chamber. The fire tray itself is made from 6mm plate steel and has a built in “snake method” to prolong the burn of your charcoal and adding even more efficiency to your fuel. Below that is an ash tray for easy emptying and cleaning, as well as being a good spot to put your wood chunks for a nice smoulder. The Airflow on the Stretch, like all our cabinet smokers, is controlled using a 2” ball valve, this is extremely accurate and can be adjusted to the millimetre to get the exact temperature you’re looking for. In addition, BBQ Guru has a 2” ball valve adapter which simply screws in and attaches to your blower for peace of mind on longer cooks. The ProQ Stretch is a fantastically reliable smoker with a small footprint for tight spaces and a great capacity to size ratio. If you’d like more information or help deciding which one of our ProQ Cabinet Smokers suits you, please get in touch here or if you’re from outside the UK, please contact your local distributor here.